Jehra Patrick is a visual artist who works out of Minneapolis, Minnesota. Her current project questions the development of art by taking visual and historical cues from museums and galleries as the subject of new paintings and photo-based work. My current work developed out of my interest in situating myself as a painter and creating my own definition of what it means to paint now. I found myself, like many contemporary painters, looking backwards to painting’s recent history and synthesizing approaches to paint and to subject matter. This process of ‘looking backwards’ made me really aware of the channels that art is located and consumed – from books, to museums, to ArtForum, to the internet - these sources all aided in forging my personal relationship with art. I looked to museums as an ending place for the medium of painting. As a physical ending - that’s where they hang and that’s where they rest in collections – and also an ending as being a triumph for an artist….if your work is in a museum, that is a measure of success. Acknowledging this system lead me to take the museum – the institution or art galleries…where art goes - as my subject. I work with gallery preparators and document exhibition spaces as they transition between shows, taking interest in the way the space transforms and the architecture of the presentation space. I also work with museum archives, looking back to past exhibitions, how they where presented and documented. 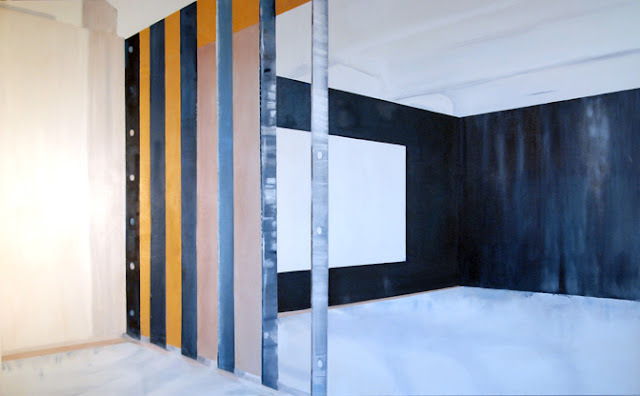 Within these images, I find moments and cues that resonate with my own relationship to art history – studs on a gallery wall might look like Daniel Buren stripes or photocopied install shots remind me of my photo-copied art history assignments. The subject matter of this project has evolved from my past work – which was more interested in image making strategies from present-day….social media, google images search results, language of camera phones….. – but working with found imagery and appropriation have been constants in my work. I think audiences are skeptical. They want to know what makes art, art. They also want access. They want to go behind the scenes. I think artists are skeptical too. They want the freedom to make art be anything and everything, but they also want criteria. Artists are aware and they have their own perceptions of different mechanisms in the ‘art world.’ The work I present is a personal language system, and could be considered insular of the art world, but I think it also opens up room for a tiered encounter. I think the work holds up well and is, on it’s veneer, very approachable. I think upon further investigation, there’s more to chew on for those who are interested. I hope to continue developing my work with alternate points of entry. Work hard and be courteous. There’s nothing worse then a lazy, high-maintenance artist. My process is really research-driven. At this point in my career – balancing my career as a studio artist with a day job in arts administration - I don’t have the luxury to really hit the studio and crank out a lot of work. I spend about 60% of my time researching, reading, writing and reviewing images, taking notes on these images, building up a ‘shortlist’ of images that would develop well as paintings. It’s not a perfect process, but this allows me to be really efficient when I actually role my sleeves up and produce work. So, I guess my work-space is part laptop, part couch, part actual studio. I’m sure there are a ton more I am forgetting – there’s a lot of talent in this state. And whenever you have the opportunity, I love to see art and artists in their studios. Sure, formal presentation suits the work best, but I love chatting with artists and hearing what they are working on or just hanging out where the action happens. Twitter. I get SO much of my art news – local, national, international – from the sources I follow on twitter. Facebook is also a great tool because you can see what fellow artists are making (or what their kid made, or what they saw in the park) or who’s going to what local opening or event. This is where I get my news from other people that I actually know. Twitter is great because you can basically customize your own stream of information and just get arts news that’s relevant for you. I have an exhibition opening at Soo Visual Art Center, New Museal, which runs February 11–March 25, 2012. Please join me for the opening reception on February 11 from 6–9 pm! I will also have an upcoming exhibition at the Rochester Art Center in May and our Jerome Fellowship exhibition in early fall. A busy year for sure!